Did You Know It's National Bubble Week? You are here: Home / Sponsored / Did You Know It’s National Bubble Week? Did You Know It’s National Bubble Week? Did you know there is an actual National Bubble Week? Well, there is and apparently it’s NOW! Better get to bubbling! Here is some fun info and even educational info about bubbles! Who knew there was so much to know about bubbles?! Despite what the thermometer says for many in the country, spring is just around the corner. And with spring comes flowers, warmer weather, children playing outside and Gazillion National Bubble Week (March 8th – 14th). National Bubble Week originated in 2000 as a way to celebrate spring. Because bubbles are such an iconic, fun outside toy, it’s only natural to use these floating spheres to usher in the season synonymous with outdoor play, laughter and sunshine. Here are some ways everyone can celebrate! First, get some bubbles! Gazillion Bubbles solution makes the biggest, brightest and most colorful bubbles around! And ramp it up with awesome bubble toys! o Gazillion Bubble Monsoon — create a skyward storm of bubbles instantly! Simply replace the cap on the bottle of bubble solution with the auto-feed cap (included), attach the solution bottle to the machine, press the button and watch in amazement as the sky fills with bubbles! o Gazillion Bubbles Tornado — This machine may be small, but once you pour in Gazillion Bubbles solution, you’ll instantly see an endless flurry of bubbles with the Gazillion Bubbles Tornado! 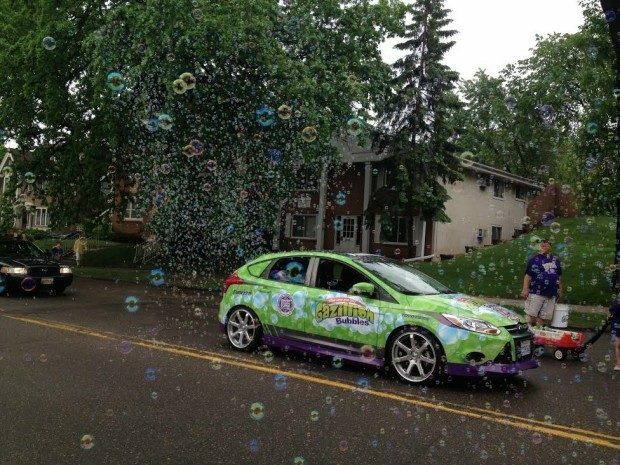 o Gazillion Bubbles Bump-N-Go Bubble Car – Fuel the car with Gazillion Bubbles solution, turn the car on and watch as it drives around, blowing bubbles on the go! Don’t worry if it bumps into something, it will change direction and keep moving while a trail of bubbles follows in its path! Try out some bubble tricks! How do bubbles work? Are bubbles always round? What happens to bubbles when you change the temperature? Test out these questions and more with fun, easy bubble experiments. o A Bubble Gets Its Color From Iridescence: As waves of light pass through the bubble, it gets distorted by reflecting off different layers of soap film. o You Can Freeze Bubbles: A bubble’s shell is composed of a layer of water molecules surrounded by two thin layers of soap. Technically, a bubble will freeze below 32 degrees Fahrenheit like all water. The only problem is that bubbles tend to burst after a few seconds, so in order to see a bubble freeze, the temperature needs to fall to a temperature that will freeze water molecules more quickly. o Why Do Bubbles Burst? : Anything that fractures the tenuous layer of water molecules can cause a bubble to burst. For example, a gust of wind or an object (like your finger) will easily cause a bubble to burst. Also, a bubble will burst if enough of the water molecules evaporate. o Many Bubbles Makes A Foam: When many bubbles are joined together, it becomes a foam. From cappuccinos to the foam on the top of your beer, bubbles are all around us. Gazillion Bubbles are loved the world over by people of all ages. There’s even a Gazillion Bubble Show in New York City, and an exhibit at the So Cal Children’s Museum focused on them. For kids, bubbles are pure fun for spring and summer outdoor frolic. For adults, (where you’ll find them at events such as proms, weddings and more,) they symbolize peace, harmony and beauty. Our suggestion: start BUBBLE SEASON right, and pop into a store today to stock up. And don’t forget to share your bubble memories and enter the annual photo contest with prizes monthly March 1, 2015 to August 30, 2015 www.facebook.com/funrisetoys.